his is the second of a series of "how to" manuals on relic hunting in rural Civil War campsites. Once a prospective campsite is found, the authors provide methods to successfully interpret the campsite history from its relics. These methods allow for an estimate of the overall size of the campsite and the delineation of various camp subdivisions (officers area, enlisted area, commissary, stables and livery, sutler store and hospital, if present) from the nature of the excavated relics of the camp. The authors show how to setup and use GPS units in relic hunting so that any newly-found campsite can be systematically searched. The GPS units provide the surface location of any relic found in the campsite. Using PC software, GPS waypoint locations from the campsite can be plotted on topographic map images or air photos. The size and subdivisions of the camp will begin to emerge from this plot. The manual shows that the layout of most Union and Confederate camps was identical and usually made up of the same subdivisions. The authors provide an extensive list of typical and rare campsite relics and show how to interpret their typical subdivision location. A special set of guidelines are also presented to further enhance the interpretation of the history of the campsite. Methods and examples are provided throughout the manual and several Civil War vintage photographs are interpreted in light of the principles presented in this manual. Several Pages of "finds" within the Trans-Mississippi are also included. 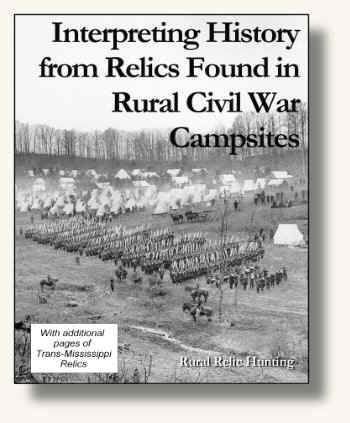 Other manuals of this series: "Finding Civil War Campsites in Rural Areas"
subparts covering how Infantry, Cavalry and Artillery camps were set up. record data, even how to track your every move while searching a camp site. search pattern, so you can return to search missed or overlooked areas. on documenting relics and their history I have ever read. pursue our Civil War Ancestors past.